Castleford Tigers' Jake Trueman against Salford Red Devils. 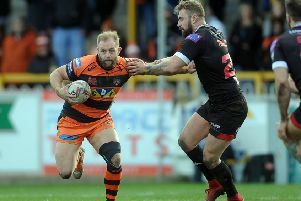 Castleford Tigers’ half-backs have been praised by head coach Daryl Powell after their performance against Salford Red Devils. Jake Trueman’s kicking caught the eye as he set up a try with a grubber and earned several goal-line drop-outs while half-back partner Jordan Rankin continued his improvement since joining from Huddersfield as he crossed for a try and made several telling runs in the first half in particular. Rankin has also taken over the goalkicking duties and landed four goals from five attempts with the kicks ultimately proving the difference between the teams as the Tigers won 24-20. “I thought Jake Trueman’s control of the game was top quality,” Cas boss Powell told the Express. “He got a few repeats and he kicked really intelligently. “He was excellent down our left hand side. “Jordan Rankin started really well. There were some promising signs from him. “Obviously he’s still fresh into playing with the team and people on the right edge has changed quite a bit for different reasons over the last few games. But I thought he was good, he was dangerous and he scored a try with a smart piece of skill to pick up that loose ball. Powell was less complimentary about his team’s defending against Salford. He said: “I thought we were a bit loose at the ruck - clearly an area we’re going to need to improve for this Friday night. “They got the game way too quick. Some of our defensive work was a little bit loose and we’re going to need to work significantly harder. “We’re going to need to be really honest for 80 minutes on Friday night because St Helens are the best team in the comp. “There’s some areas we need to improve that’s for sure. Powell added; “We were a little bit shaky at times and I don’t think we were ever at our best although we got the two points. “There were some periods of play where we were excellent, but it’s just the consistency in our game that wasn’t as good as it could have been.